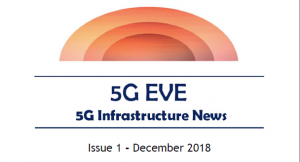 5G Infrastructure News is the free e-mail newsletter of 5G-PPP project 5G EVE. The newsletter is published bi-annually and provides concise information about the activities and results of 5G EVE. The first edition will be published in October 2018. In order to subscribe to ‘5G Infrastructure News’ please enter your e-mail address in the form below and click ‘Subscribe’. You will receive an e-mail containing a confirmation link, which you need to click for completing your registration. 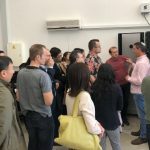 The 5G EVE project consortium will not share the e-mail addresses of subscribers with any third party, and they will only be used for sharing news on the project with subscribers. After the mailing of the last issue of 5G Infrastructure News there will be no further mailings to subscribers. All subscriptions will be automatically terminated as soon as the project is administratively closed. You can unsubscribe anytime by sending an e-mail to contact(Replace this parenthesis with the @ sign)5g-eve.eu with the subject line ‘Unsubscribe 5G Infrastructure News’. In addition, there is an unsubscribe link at the end of every e-mail newsletter edition we send out. Please contact us, if you have any questions or suggestions.